Home Sellers: Are Your Days On The Market Catching Up To Your Square Footage? 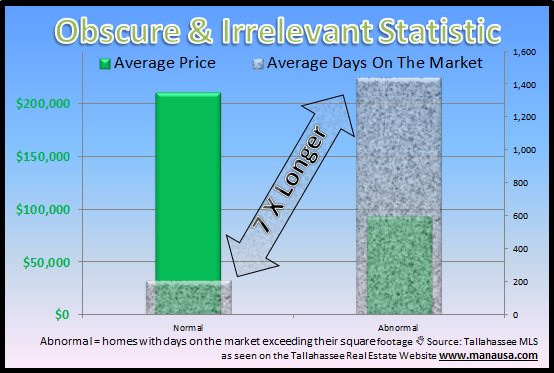 Anybody who has read the Tallahassee Real Estate Blog over the past six years knows that I have a "pet peeve" for the Days On The Market real estate statistic. Why? Because it's a fallacy. It cannot be realistically measured. It is gamesmanship usually played by the ignorant, for the ignorant. There is not a measurable amount of time it takes to sell a home, so I have come up with a new statistic that is far more entertaining. No matter where you go in the US, you will find the old guard among real estate professionals reporting days on the market as a significant piece of information for people who want to sell a home. They say "currently, the average market time for a home like yours is 87 days ..."
They figure that if they analyze "days on the market" or "days in the MLS" for similar homes, they can prepare you for how long it will likely take for your home to sell. This is pure (as my high school football coach Jim Sauls would say) "Horse Hockey!" Why Is My Home Not Selling? But the purpose of this post was not to harp on my pet peeve regarding the fallacy of "days on the market," rather it was to expose a frightening new real estate statistic that I uncovered yesterday while doing some research. Hold on to your hat. Question: What percent of homes for sale in the Tallahassee MLS have a days on the market measurement that is greater than the square footage of their home? In other words, who has more days on the market than they have square feet of space in their home? I was amazed to find that 3.1% of the active listings for sale in Tallahassee have been for sale for more days than they have "square feet" in their homes. Bizarre. Can you imagine having your home prepared for showing for 5 years? In the Tallahassee MLS, there are 52 homes for sale that fit this category. They average 1,440 days on the market (four years) and have been for sale 7 times longer than "normal" listings. I truly wonder what these homeowners are thinking? They should either sell their homes fast or pull them off the market until values return a level that would satisfy their needs. If you would like to know how to sell your home in fewer days than the number of square feet that you have in your home, just drop me a note, and we will be happy to show you how to sell your home fast. You don't need to grow your days on the market to crazy levels, there is a better way!